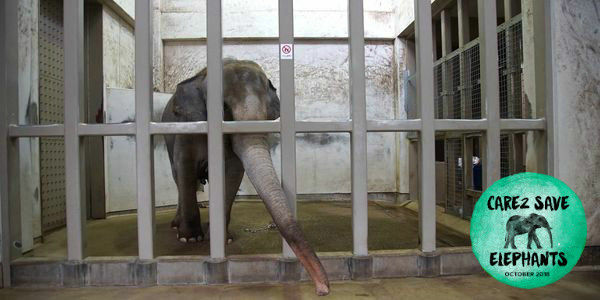 Sunny the elephant has been TOTALLY ALONE in a concrete prison for 29 years. When it's cold and snowy, she is forced to spend most days locked in her tiny indoor cell at the Nomi Ishikawa Zoo in Japan. With nothing else to do, Sunny tries desperately to cope with her boredom and loneliness—by exploring the walls with her trunk. The heartbreaking evidence: Dark marks all over the walls of her tiny cell—as far as her trunk can reach—from Sunny doing this over and over, alone, bored and trapped, day in and day out ... for 29 years and counting. It is cruel and unnatural to make Sunny spend her life in solitary confinement in such a tiny living space. It's an undeserved punishment for an animal that is naturally highly intelligent and social. Elephants live up to 70 years, and are exceptionally social animals who have families and friends. They grieve their dead. But finally Sunny's plight has come to light! Sunny still has a chance at a better life: experiencing soft soil on her feet, companionship and enrichment to occupy her very intelligent mind. Elephants in Japan, together with wildlife organization Zoocheck are working to help Sunny and other captive solitary elephants in Japan. BUT we need your help! Please sign and share this petition demanding change for Sunny! - They have introduced feeding challenges, water activities and sand in her enclosures. Sunny is free to go in and out during the day as she pleases. YOUR VOICES HAVE BEEN HEARD! Earlier this month, we sent a package containing (a staggering) 480,000+ petition signatures to Sunny's zoo and presiding prefecture. We have just heard back from the prefecture notifying us they have received our letter and petition, and we are now preparing an official complaint with the institution. We will keep the pressure on, and keep you posted on any new progress. Thank you for acting for Sunny!